Take a trip to small-town Cobble Creek for sweet romance in these three contemporary novels. Come take a walk down Main Street where neighbors pick up a treat at the old-fashioned soda counter, window-shop at boutiques, pick up flowers for their friends, and enjoy the small-town arts festivals and outdoor concerts. Frankie understands the inner workings of clocks and pianos, but not dating. Well, that’s a bit more complicated. Local business owner, Frankie Lawson, knows the inner workings of clocks and pianos but not those of her own heart. She’s never been one to shy away from a project, unless that project is a romantic relationship for herself. A pro matchmaker of antiques and owners, she tries her hand at fixing up Dr. Wells with an old friend. The trouble begins when she realizes she’s made the wrong match and Logan was meant for her. When words don’t come easily . . .
Cobble Creek’s divorce attorney, Isaac Murphy, is not interested in romance. Quite the opposite, in fact. As a supportive brother for his sister raising a daughter with selective mutism, Isaac has seen enough disappointed hearts and broken marriages to know love takes more than a bouquet of roses or flowery phrases. No, Isaac is all about being pragmatic when it comes to relationships. As the small-town florist, Brooke Holt is passionate about romance in everything from picnics to horseback riding. A closet musician, she pours her romantic dreams into writing country love songs—which she might even share someday, if she weren’t stricken with a severe case of stage fright. When Brooke’s brother shows interest in Isaac’s sister, what starts as a friendly wager between Brooke and Isaac to prove whose way is right brings out their competitive streaks and rekindles their old high school friendship. As feelings start to turn into something more, though, expressing those feelings seems like an awfully risky gamble. To say Tess Graham has a complicated relationship with her hometown is putting it mildly. With family ties and a successful real estate business she’s built from the ground up, Tess doesn’t want to leave. Not really. She would, however, like someone to see her for who she really is rather than the overshadowed twin in one of the town’s most prominent families. If only she could make a name for herself and find her place in Cobble Creek. When handsome wildland firefighter, Monroe Scott, comes into town and wants to buy Tess’s grandfather’s barn for his reclaimed wood business, Tess feels a tug of nostalgia she didn’t expect. How can she allow Monroe to dismantle her childhood memories board by board? But as the listing agent, how can she prevent it? To get what they each want, Tess and Monroe enter into a very temporary, very pretend engagement. These kinds of collections are so much fun! I love reading them and in this case, getting to revisit some of my old “friends!” I’ll break down the review by book for you. This book was just what I was hoping for. A cute, clean romance that I didn’t want to put down. It transported me to the tiny town for Cobble Creek, Wyoming. Just what I needed for a quick break from real life! I loved the characters. Frankie is such a fun character. She’s an Upcycler, I really love the way she makes fun things out of things you never would have thought would work together. Things like lamps, mirrors and clocks. I really loved this whole aspect of the story. And I really loved that Frankie thinks she can’t care for kids, but when Harper comes on the scene, she is perfect with her. I loved the scenes where these two were together making things. Then there’s Logan. I love the way he’s the perfect dad for Harper. He makes the move from their home to Cobble Creek to give her a new start, actually it’s something they both need. I loved how he sees that Frankie is good for Harper, so he puts aside his feelings of annoyance with her and just lets them work together. Something that was great for all 3 of them. The plot of this one is clever. I loved the name of Frankie’s store, Frank and Signs, so fun and clever. I loved the way Frankie keeps trying to set Logan up and she can’t see that her setups are just not working for anyone. And the ending is just amazing! Make sure to pick up your own copy of this one! I was so glad to get to “go back” to the town of Cobble Creek. I loved the Brooke is Frankie’s friend from The Inventive Bride,and that we get to see her again for a little bit in this one. It’s just fun to see your favorite characters in more stories. Brooke is such a cute character. She reminds me a little of the flowers that she works with in her flower shop. She’s perky, cheery and just cute. I love the way she’s such a romantic and she believes in love. I really loved watching her with Isaac’s niece, Gemma. Her neice reminds me a bit of one of my own who has since grown out of the condition that Gemma struggles with in the story. Then there’s Isaac. I loved that he and Brooke had a history that they both remembered, but I really loved that their history didn’t make their interactions awkward. I liked the way that he changed a little at a time all the way throughout the story. Eventually getting to where he could believe in love, even when he was jaded at the beginning. I loved the plot of this one. Brooke and Isaac have a bet about their siblings Danielle and Cody and whether or not the two of them would be able to make it as a couple. This leads to lots of sneaking around and crazy shenanigans by Brooke and Isaac. And lots of time spent together might just lead to a rekindling of feelings they felt when they were younger. Make sure to get this cute book, you’ll love it as much as I did! I LOVED everything about this cute romance! I loved the characters, I loved the plot, I loved the idea of a firefighter coming to town, and a pretend engagement? That really is the best! Tess is a fun character. I loved the way she grows throughout this book. At the beginning, she feels inferior to her twin sister, Ava, in almost every way. That’s what spurred her into a pretend engagement. But as she goes along, she realizes that there’s no need to feel jealous, that she had always been where she was meant to be. The pretend engagement though is where the real fun begins! I loved the way she tries to keep Monroe at arm’s length, even as she falls hard for him. I really just loved her as a character. Then there’s Monroe. He’s a wildland firefighter, only in Cobble Creek because there’s a fire nearby that needs to be fought. I loved that he was willing to go along with Tess’ crazy idea. He’s a great guy, he’s kind and generous. His flaw for Tess might be that he sells reclaimed lumber and wants to tear down her grandpa’s old barn and use the lumber. I loved how he was handy and his idea for the barn ends up being such an amazing thing for Tess and really for the whole town. The plot of this one is fun. There’s love, of course, danger, and the kind of pulling together that only happens during a disaster. This one’s a winner! 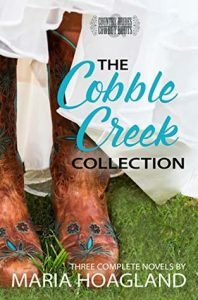 I was sent an e-copy of The Cobble Creek Collection as a gift from the author. All opinions are my own.